It was the silence that we noticed first. The game on screen had suddenly gone quiet. We were sat on the sofa in front of our ‘living room setup”in the Three Fields Entertainment office watching one of the Aftermath sequences in “Danger Zone.” It’s really easy to lose all sense of objectivity when you make games. So we’ve always found it important to do those final playthroughs together as a team. As a group on the sofa, passing the controller back and forth playing it trying to pose as both novice and expert player. Unlocking every Achievement. Earning every Trophy. But this wasn’t a final play through. If making games was for everyone, then everyone would be doing it. The world is full of players. Millions and millions of people love playing games. But over the past two decades I’ve learned that actually making them is a very different experience. And requires a completely different set of skills. As well as persistence and a lot of patience. It might not be as glamourous as I’m sure you might think it is. You get to sit in front of a monitor for long periods at a time. You see every facet of the software up close. You’ll see it at the start, a blank screen on the very first day of development. You’ll see it at the finish line, right up to the moment when a button marked “UPLOAD” is clicked and it finally leaves the building, ready to be shared with the world. And you see it every single day in between. We get to see things happening in our game that no-one else will see. We get to see failed experiments temporarily brought to life, shining quite brilliantly but only briefly. We get to see spectacular moments that be for our eyes only. We get to see our games brought to life. And we also get to see them when they are ugly – when they don’t work, when nothing ever seems to work. We get to see them when they are dull, lifeless and no fun at all. 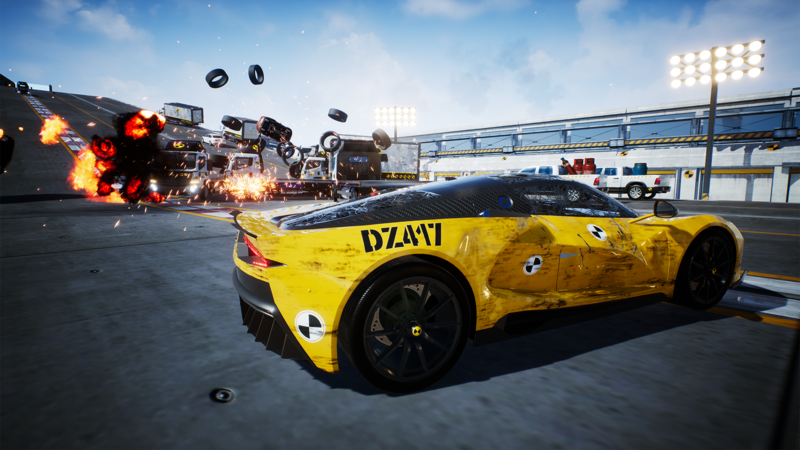 In the first three months of this year, we developed Danger Zone for PC and PS4. We wanted to release the game on Xbox, too but our game just wouldn’t run well at all. Massive teams are able to throw programmers at platform problems and spend weeks and months clawing back performance to keep all shipping versions roughly in line with each other. In fact, this was the exact advice that MS had given to us at their last development conference. But as a small independent team, we simply couldn’t afford to spend months optimising engine code. We had a game to make. We could see from Epic’s roadmap that a huge amount of fixes and Xbox performance would be coming down the pipeline later in the year. We decided to put the Xbox version of the game on hold, and wait and see what the engine improvements would be. So in early June, we got the game up and running in the latest version of Unreal Engine. Performance was better than we had expected, so we knew we’d be able to bring the game over to Xbox. This gave us an opportunity that a lot of developers don’t get to do. To not just bring the game over to a new platform but to try and improve it in almost every single area. As we got started, we gathered around the office TV and revisited the software. And that’s when we started to see the game through entirely fresh eyes. 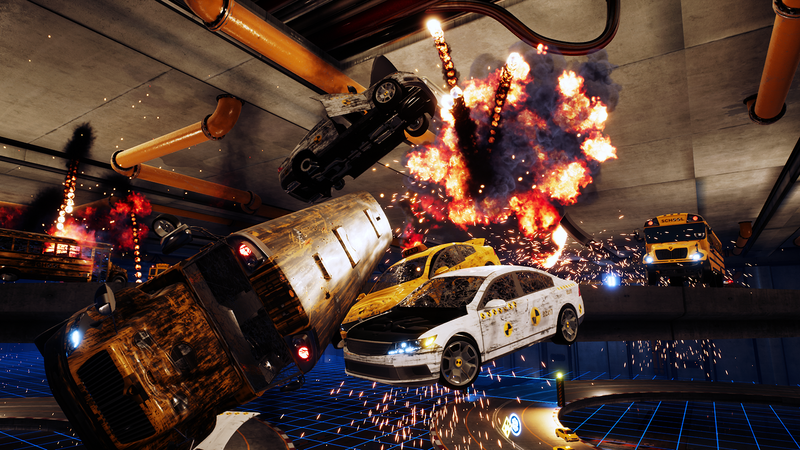 For a game all about car crashing and big explosions, it was clear that a few things were going to have to become a lot more frequent and a lot more obvious. In the world of theatre it’s the job of the Director to bring the script to life “from the page to the stage.” This means ensuring that the actors performance, hair, makeup, costume all work in tandem with the stage direction, set design, sound, music and lighting to bring the script to life. For our game, and every game I’ve worked on over the past two decades, we do things slightly differently. If anything we are trying to bring the game to life “from the Editor to the TV screen.’ (It doesn’t have quite the same ring to it.) When we’re building the game using the engine Editor, we can experience the game from almost any camera angle. We can see everything working as it should do, and also things happening that the player will never see. The problem lies when we fail to realise that the player isn’t getting to see and thus understand all the things that we are able to see. Back to that sofa then. The game was quiet because there simply were not enough explosions happening. The first improvement we made was to overhaul the explosion system. This would immediately trigger bigger and more frequent explosions. We’d seen a lot of great moments where the player could bump or ‘check’ one car into the path of another car but as a Player you probably weren’t quite being made aware of it enough. 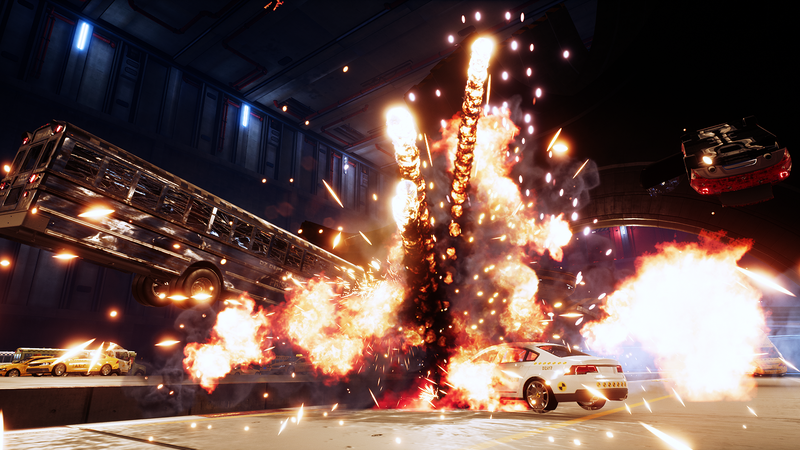 We made all checked vehicles explode on impact, which made every level which featured traffic checking 100% more exciting. We also made cars explode when they were tumbling through the air or falling. And rather than de-materialising the cars when they fell off the edge, we let them fall to the floor….and then blow up when they did. These changes also had a wider effect. They made the game more entertaining for others to watch. 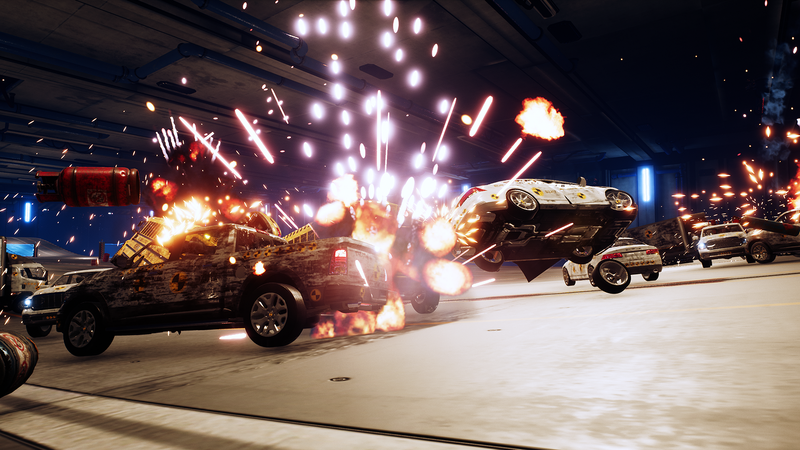 Our company motto is to make games that put a smile on your face, and for some reason knocking cars about and making them blow up does tend to do that. Next we looked for ways to try and further how the game could better communicate to the player what the consequences to their actions were. The great arcade game designer Eugene Jarvis once stated quite simply, “players like games they are good at.” Those words have always stayed with me over the years ever since I read them (which was in Martin Amis book “Invasion Of The Space Invaders” in case you are interested) and I think it extends to including that players like games that they can understand and then master. I also believe that software has to work as hard as possible to communicate to the player what is really important. With that in mind, we felt we that our effects and damage systems could with an overhaul. The player was hitting a lot of cars and whilst we knew it was happening, we weren’t calling attention to that fact either visually or aurally. So the traffic behaviours were revisited. We improved traffic checking, making it much more reliable and much more pronounced when you did it. We also made sure that the traffic became better at panicking and displayed more complex behaviour when starting to crash. The player car wasn’t generating any sparks either, so we made sure it did, made the sparks physically accurate, and improved the visual quality of the SmashBreaker sparks too. We spent a fair bit of time studying the Aftermath sequences – the bit at the end of each crash where the camera pans around and shows off your score for each vehicle crashed. We had a system where the doors, boot and bonnet (that’s “trunk” or “hood” for our American readers) would detach in the middle of the action, but it wasn’t working nearly as often as we wanted it to. So we made sure it would all happen when it needed to, and we improved how tyres should bounce as well. We also thought it was a bit odd that the “TAXI” lights stayed on for the Aftermath, when it was clearly obvious that any taxi driver wouldn’t be touting for a fare after one of our pileups. So we fixed that too. Finally, we made several improvements to both CPU and GPU performance which gave us more stable performance across the whole game, implemented better quality AA, and improving the visual quality of the flyby, aftermath and in-crash action cameras. These improvements, done at the start of the Xbox development period gave us a better game, delivering much more of what we originally set out to deliver. We remixed the entire game audio, creating new engine sounds, adding extra sirens and improving the detection of the impacts which gave us a lot more sounds which we suspected were missing. We also tweaked and tuned the HUD, focusing mainly on the score and Medal sequences. As we began working on Xbox, we also did work to support owners of the PS Pro hardware adding in 4K Temporal Checkerboard rendering and also 150% super sampling for those PS Pro owners playing our game on 1080p displays. The thing we were really excited about, which Phil Maguire covered in his excellent blog post here, was when we discovered that we would be able to deliver native 4k on the Xbox One X. That was a GREAT day and something I personally have been very excited to see. So when you next boot up the game on your sofa on whichever system you play on, you’ll know what we did last Summer.